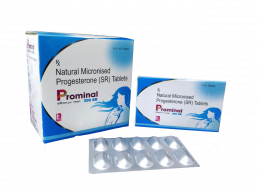 Progesterone is used in the treatment of female infertility and hormone replacement therapy. It is also used to restore menstruation in women with secondary amenorrhea (the absence of menstrual cycles). Progesterone is a progesterone (female hormone). It works on the lining of the uterus and helps to establish and maintain pregnancy in infertile women. It helps in protecting the uterus from the negative effects of estrogen when used for the treatment of postmenopausal symptoms.